WP Multi Store Pro Locator is a convenient plugin that allows you to give directives on the locations of all your stores, so that you can promote them. Of course, you must indicate all the location information of your store so that it is well referenced. If you refer to your stores, visitors to your website will find those nearby, and can search by category or tag. In addition, the plugin offers different options from location features which are very useful for the management of your shop, such as import / export options. Finally, the WP Multi Store Locator Pro is a convenient plugin that works very well with popular page builders, by using their custom block for Visual Composer, Divi, Elementor and Beaver Builder, and more… If you are interested, you can visit live preview of 5 WP Multi Store presentations. 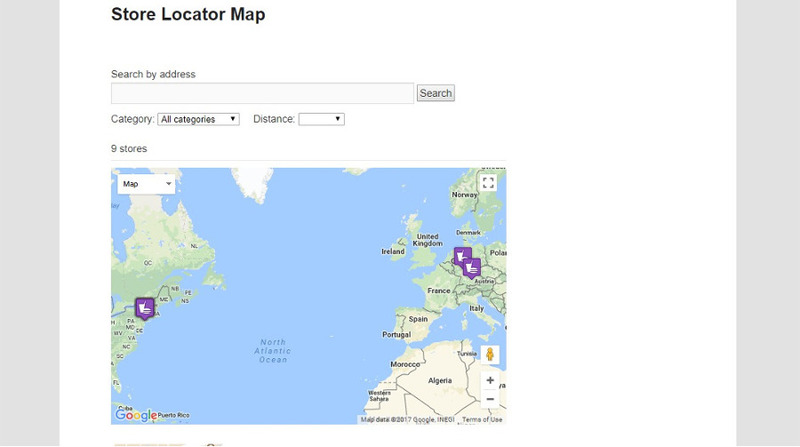 The big advantage of the WP Store Locator plugin is its free and customizable map. Indeed, you can choose the language you want to set the driving instructions. To simplify searches for your users to reach your locations, there is an option to add labels that you can set up with different options. In addition, with WP Store Locator you can specify an indeterminate number of stores while choosing the language of presentation you wish.Using short codes, you have the possibility to specify the opening hours, and the coordinates of your stores. There are 9 accessible retina marker icons that are movable for the exact location on the map in the editor. The rally option is very convenient if you have a high density of stores in the same area. Finally, you can benefit from premium add-ons for data aggregation, dense import or adding a search widget. The WordPress Store Locator Plus plugin allows you to enter an address locator for all your stores on your website. Through a simple configuration, the plugin allows you to create a page, add your coordinates and enter short code. Today, international brands, such as Bosche, use this plugin for users to find their stores. Thanks to administrative tools, you can modify your plugin with CSS and HTML. With the additional modules, you can configure different functionalities and enrich the user experience, by activating or deactivating the search tool, categorizing the locations, creating pleasant referencing pages by location, …. These additional settings allow you to embed social network links into your sites, custom fields, or allow users to administer sites. With the help of Gravity Forms, you can develop questionnaires and with Event Location Manager you can record events to your locations. Finally, with the free plugin you can benefit from a panel of several countries and languages. If you want a plugin with many features, you should be interested in the Agile Store Locator. It is offered with an entire system to organize and handle themes and markers.You can manage the import and export positions of your stores, organize categories and communicate positions on custom maps.You have the option to modify your presentation and a large number of predefined templates. But only one store is viewable in several categories.In addition, open stores may appear by activating / deactivating a timer. The plugin offers different models, with panels and a ranking of countries, states, cities and stores. If you have a large number of shops and positions, the customization settings, clustering of markers and categories are useful for doing a more accurate search.Using the information display, you can manage the position of the stores already created by multiplying them.The Analytics tool helps you analyze searches, the best stores and positions. Finally, all store, search, category and marker statistics are available on the admin dashboard. Super Store Finder for WordPress is offered with a convenient WordPress store locator admin section and a smart responsive design. You can modifiy many settings from the admin page like map, categories and notifications. You can also personnalize styles, themes and labels. It it gives access to many languages and also full width Google Map display. Super Store Finder offers a neat store filter and a flat theme store locator with folding panel. The geolocation option helps users to find the right location of your store and the shortest itinary to join it. The option to zoom in on a street can direct a user directly into your shop. In addition you can add photos or videos to present your store. Thanks to the plugin you can use custom markers and search stores by region or by other criteria. Using CSV files, you can bulk import store addresses. By moving the markers you can locate the right places. There are additional modules to expand the range of features and possibilities. With Advanced Store Locator, you can display your store locations in many ways – on a Google map, on a list or on both. In addition, you can edit a post about the location you wish on your WordPress blog and link the location to this publication with shortcodes. By providing key information about your location, you will attract users with originality. However, you can present your store information in related publications. Finally, users can search for a location by address, use a street view to find your shop and get itinary to it. Using the built-in interface, you can easily add, edit or delete shops, and automatically geocode coordinates.With addresses or zip codes, users can search for the store most nearby.On a safe https URL, the plugin can detect a user’s location and present the clothest store. With the WordPress Store Locator plugin you can add the filters you want. The plugin manages live filtering and shortcodes on all pages. By linking product categories to shops categories, you have the option to engage automatic filtering on the product sheets. You can customize; the results displayed during a search, the information to display and the call to action buttons. Finally, you can define variables for your new stores to simplify adding. Thanks to this plugin, you can set up a store locator tool on your WooCommerce Product page. This locator will be visible in a modal. You can configure the information page to display contact information, calls to action, recorded images, and hours of operation. With a total of more than ten parameters and more than 90 options, you can help users find your store. 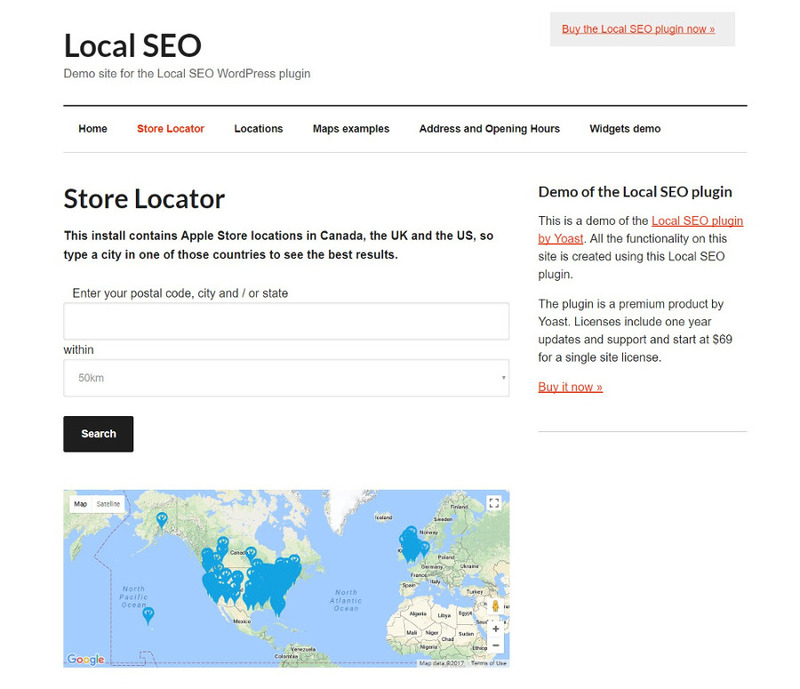 Yoast’s SEO plugin for WordPress offers a WordPress store locator option. To use this location search feature, you must purchase a year-round license. With this plugin, users can rank locations by perimeter, state, or zip code. By filling in the options, you can set up the address of your store to the page, as well as your working hours. But you can also add them using short codes. You can embed short codes on all pages, publication and placement pages. With the help of a widget you can define a WordPress store locator in the area you want from your Website. If you use only a defined number of positions, the Google Map plugin tool, such as the advanced Google Map plugin for WordPress, is sufficient. You just have to set the locations on the map and follow the directions. Compatible GDPR, this mapping plugin is the most purchased. It integrates the management of several map filters, offers different routes, and the option “search nearby” to define the nearest location. VO Store Locator is a plugin with useful tools for marketing professionals, franchises and distributors. This plugin is free and helps you to set the pin tones for all labels to distinguish locations. Options are included to help you to find the store closest to your country and detailed directions allow you to do an easy search for your storefronts. Finally, the plugin is compatible with the Visual Composer drag-and-drop page builder to allow you to integrate your custom maps into any publication or layout. Simple Map Store Locator is a plugin that allows to locate international stores, with an easy handling, users can search the database by using postcodes. You can then, display your postions with customizable tags. Other convenient options include unlimited locations, customizable map search results, quick configuration features (no codes required), and a simple editing option for instant map and database updates. Locatoraid is another WordPress store locator plugin. It is lightweight, intuitive and offers a large number of customizable cards. In fact, the plugin is sold with an automatic geocoding option. Thus, you can locate them in real time. The shortcode, easy to use, facilitates the integration of your card (with perimeter, layout, etc.). Simply change the options to a space of publication text, page or widget. Finally, this map can help you find the location of your location with your site’s style. With WP Multi Store Locator you can manage multiple stores thanks to the WordPress dashboard and display the results in the front end by an easy shortcode with the Google Maps API with more search parameters. Thanks to this plugin, you can also join and manage sales managers for each store.You can also view import / export data and search results from sales managers and stores easily. WP Google map is one of the easiest and most exploited plugins. It allows you to integrate a Google map adapted to your publications or your displays, thanks to a short code. You do not need to add iframes to embed a Google map into your WordPress website. In fact, you only have to assign the WP Google Maps plug-in to accomplish this task easily. Google Maps WD is a WordPress store location plugin created with Google Maps. It was made to be intuitive and attractive, so easy to use on all devices. Moreover, with this plugin you have the possibility to integrate an infinite number of maps on your Website, and single pages or blogs posts. With this plugin you can fully manage the access of each option and every facet of its use, which defines why it is heavily downloaded to more than 20,000 websites. When user scrolls a location on the map, he knows the name of the destination, as well as other information, such as a description of the place and address. This plugin gets a rating of 4.7 out of 5 stars, it has a usefulness and quality guaranteed.